Would you like to spruce up your old furniture or automobile? Come let us teach you how to change it! Whether you are looking for a job in restoring antique furniture to give it a facelift or updating your antique car, this is the class for you. We offer Certificates of Proficiency in Household Upholstery and in Automobile Upholstery. This program provides the student with college credit and invaluable workforce skills. The Household Upholstery Certificate consists of 6 courses (24 semester hours), and the Automobile Certificate consists of 4 courses (16 semester hours). Courses are taken sequentially in 8-week academic terms. These certificates are designed to equip the student with essential job skills for the workforce. The Certificate of Proficiency for Auto Upholstery can be completed in four 8-week terms and the Household Upholstery can be earned in six 8-week terms. 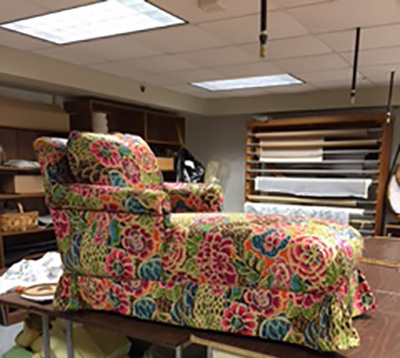 Upholstery classes are held in building 842 on the Little Rock AFB, and special access must be requested for students who do not possess a military ID card. 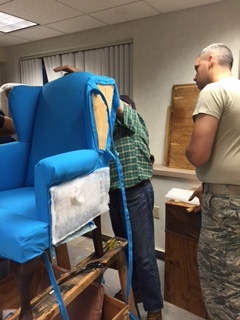 Please ask for details on how to apply for the special access to the on-base upholstery lab. 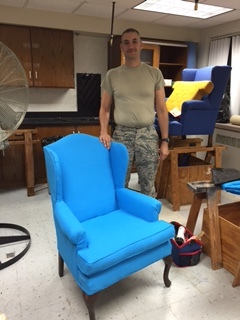 The first project for a new student is a wing back chair. 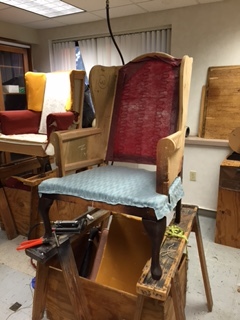 This particular chair teaches the student to remove old fabric and stuffing and repair any damage to the frame. They learn to sew on an industrial sewing machine, make welt cord, re-upholster the chair, and make a seat cushion. These are three photos of a rebuild. Special access must be requested because these classes are held on the Little Rock Air Force Base in Building 842. This class is open to public. We offer transfer options with several other Universities such as Arkansas State University (A-State), Arkansas Tech University, University of Central Arkansas, etc. Below is a link to all of our available transfer options.